Research and development exploring new possibilities in information technology, life for all is cosseted by the advantages of luxurious tech goodies. One such goodie is the iPhone and the iPad from Apple. Music wherever you go is what iPad facilitates while iPhone is like your mobile phone and also has all the features of iPad. Undoubtedly, your iPhone or iPad has all your personal information, chat history, text messages, pictures, music files and may be even some confidential data; data which you cannot afford to lose. Open the iTunes application on your system. Connect your iPhone or iPad using the USB cable to your system. Now, click on the newly found hardware on your system i.e. iPad or iPhone. Click on the ‘Options’ of your Apple device and select ‘Encrypt iDevice Backup’. A dialog box will appear asking you to create a password. One important factor is to never forget the password since you will not be able to recreate it again. Once you click on ‘Set Password’, iTunes will automatically encrypt the backup of your Apple device. Open iTunes application on the system. Click on ‘Preferences’ in the Operating System (OS) in the computer. 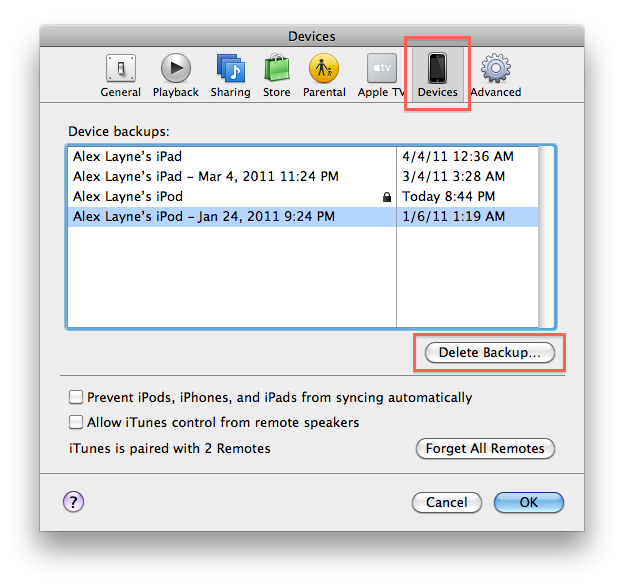 Click on the ‘Device’ button and you will get a list of all your backups. Click on ‘Delete Backup’ and all is done. When you delete your old backups in your iPhone or iPad, you get a comparable amount of free disk space without wasting much time. Following these simple steps, you can be sure that your critical information is safe and sound, be it in anyone’s hands. Nice trick. Thanks for share.